This is an example of an exercise that you’ll learn in my seminar “Balance and Stability Exercises”. This is a great exercise because the squat helps to strengthen all the major muscles of the lower body, and the BOSU is excellent for providing an unstable surface. BOSU is short for “Both Sides Up”. This piece of equipment is designed to be used with either side up (or down, depending on how you want to look at it). The BOSU is essentially 1/2 of a stability ball with a solid, flat base. For this exercise you want to place the BOSU upside down (the ball side down/and flat base up). You want to stand on the BOSU with your feet about shoulder width apart and your toes pointing straight forwad. 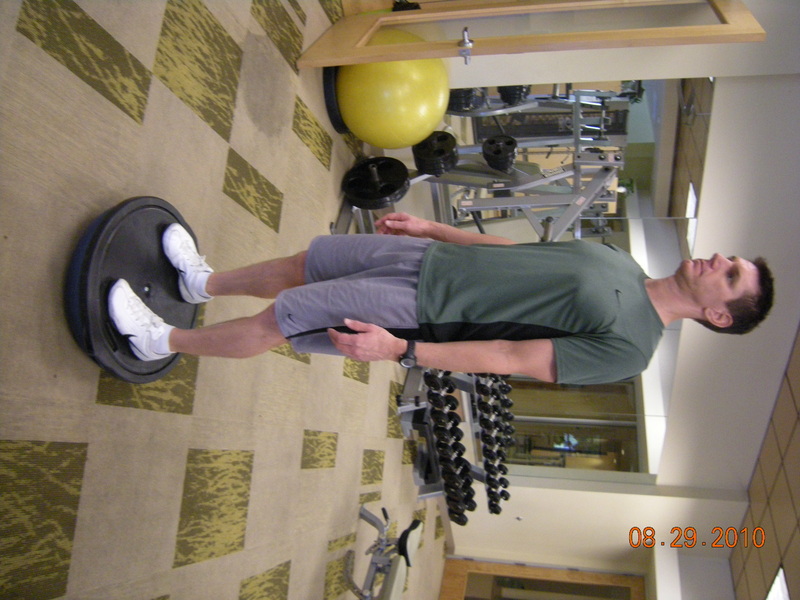 The easiest way to get on the BOSU is to place on foot on the base near the edge. If you look at the BOSU as a clock, place your foot in either the 3 or 9 o’clock position (depending on which foot you choose to place first). 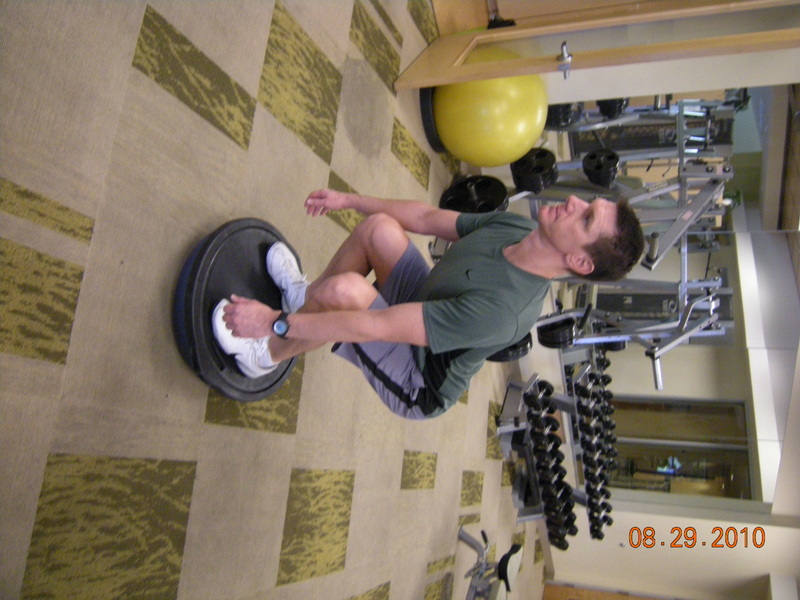 Slowly place all of your weight on that foot until the edge of the BOSU is touching the ground. Then carefully place your other foot on the opposite side of the BOSU. Slowly transfer your weight toward the foot you placed on the BOSU second, until you are standing with even weight on each foot. NOTE: The BOSU can be extremely unstable until you learn how stand on it properly. The good news is the learning curve is steep, so you’ll figure it out quickly. If you have difficulty standing on the BOSU, don’t attempt to perform the squat. Instead the exercise for you is to simple stand on the BOSU until you establish balance, stability and confidence. Once you do then add the Squat. As you stand up and return to the start position, you should exhale. Your knees, hips, and back should all return to the start position simultaneously.